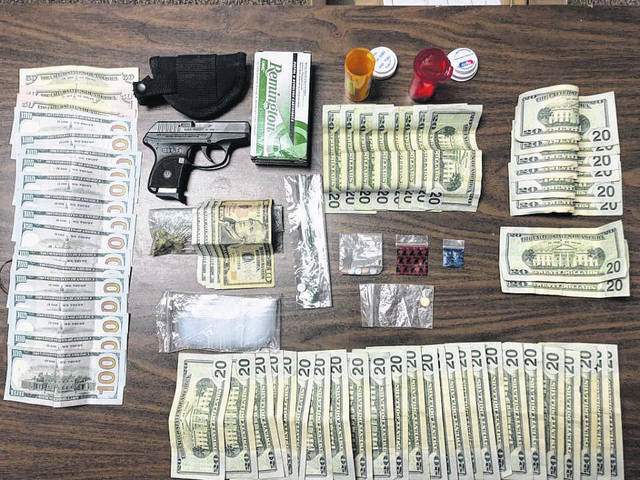 Several items of contraband were seized during a search warrant execution which included suspected methamphetamine, suboxone, valium, marijuana, other alleged drug paraphernalia, a handgun, and over $2,600 in cash. GALLIPOLIS — Gallipolis Police Chief Jeff Boyer released information about a search warrant served by the Gallia-Meigs Task Force Saturday night and Sunday morning which recovered suspected drugs and paraphernalia with two taken in custody. The warrant was obtained through investigations by the Gallipolis Police Department and the Major Crimes Task Force of Gallia-Meigs Counties with the assistance of Gallia County Prosecutor Jason Holdren. The search warrant was served by the Gallipolis City Police Department and the Major Crimes Task Force of Gallia-Meigs Counties at an apartment located on Grape Street in Gallipolis. After securing the residence, officers completed a search of the premises. Several items of contraband were seized which included suspected methamphetamine, suboxone, valium, marijuana, other alleged drug paraphernalia, a handgun, and over $2,600 in cash. Task Force Agents arrested an adult woman from Gallipolis and a male juvenile. The case will be presented to the Gallia County Prosecutors Office for future grand jury considerations. The Major Crimes Task Force of Gallia-Meigs is a state task force under the jurisdiction of the Ohio Organized Crime Investigations Commission which is part of the Ohio Attorney General Office, the task force was formed in September 2013 and consists of the Gallia and Meigs County Sheriff Offices, Ohio Bureau of Criminal Investigation, the Gallipolis City Police Department, the Middleport Police Department, and both the Meigs and Gallia County Prosecutor Offices.